I’ve had several opportunities to ride the XYZ Bikes Men’s Beach Cruiser since my initial ride in late December, and for a $100 bike — I’m happy with the results. It certainly would be an inexpensive way for people to find out if bicycle commuting is for them. There are a few soft rattles when I hit bumps — but not as many as I’d expected, and not bad for a $100 bike. The handle bars seem a bit loose. It may be that I’ve not cranked down hard enough, although I thought I had. Long, steep hills can be a challenge. At 6′ 5″, I may be a little tall for the bike, but it is workable. It weighs in at 35 lbs. per the scale at work. My longest one-way ride was 7 miles in the snow. I can imagine I’d be fine for about 10 miles in the snow, maybe 15 without, but I don’t think I’d take it on rides longer than that. The weather this winter has been pretty lousy and I quickly found out that the wide tires that come on this bike work great in the snow. I tried ridding my hybrids last winter and I slipped around on the ice — a lot. 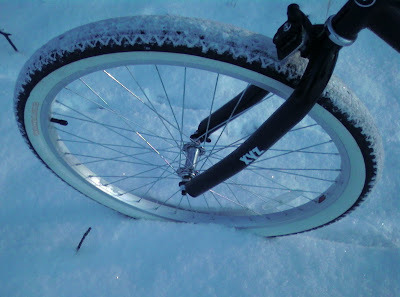 The XYZ bike worked like a charm on snowy and icy streets and paths with the only slipping I recall occurring on a long sheet of smooth ice. I have to admit that the drive train got a little sluggish when the temperature got down to ° F. Riding in snow, slush, ice and road salt coated the bike in grime that was quite easy to clean up. Having this bike available allowed me to ride to work 12 days over the last two months that I know I would have skipped before. This WILL be my snow and rain bike from here on out. A few weeks back, Tim asked what we can do to get more people out on their bikes – and what are some good options for cheap bikes. This bike fits the bill. It’s a fun ride for round-trips of less than 10 miles. The retro look catches people’s eyes and I’ve gotten some nice comments about how cool the bike looks. My bicycle friend Jim Shirk, a local Hillsborough County guy who is a big bike advocate, event volunteer and all-around supporter of all things cycling, is trying to get every household to have an errand bicycle. Great idea. We all take ultra-short trips in our car that could easily be done by bicycle. So Jim is suggesting you have an errand bike to run, well, errands. This fits in nicely with the Cliff Bar 2-Mile Challenge. * In the U.S., 40% of all trips are 2 miles or less. * 90% of those trips are by car. With gas prices around $3 a gallon, the cost of this is the same as a little over 30 gallons of gas. 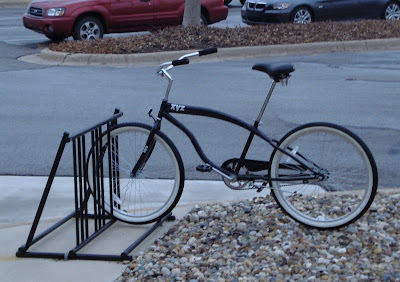 Why not spring for a beach cruiser along with the fenders and basket. If you’re looking for an inexpensive, good, fun bike, check out all the bikes at XYZ Bikes. Great overview and great points about the need for more “errand bikes”. An inexpensive bike reduces concerns about theft, salt/grime damage, complexity, etc. and just lets folks do what they need to do for short trips around the community. Your errand bike should have some baskets, too — making it even more versatile! With gas prices around $3 a gallon? On the East Side of the Big Pond it’s the equivalent of $9.18 a gallon. Makes that bike even better value for money over here in the UK! The thing that really stands out to me is the amount of seatpost showing in the photo. Does it feel sturdy and safe or does it feel flexy? A 100 dollar bike does seem like a good alternative to used bike. I’m sure that when I finish perfecting my commuter project bike I’ll in it a bit past that figure. That is sweeeet for 100 bucks. I have cycling shoes that cost more than that, but don’t look half a s cool! True, a nice reliable single speed at that price seems like a good option for budget minded people without the tools/time/skills to take on an old used bike. The only thing I’m a little concerned about is that seat post. It looks awfully long. Does it feel secure, or is there a good chance that a tall guy like you or me could get careless, hit a pothole and end up sitting on the rear tire? It took me about 5 rides to get the quick release seat posted tightend the correct amount to keep it from sliding down while I rode. I have it pulled out to the point that I have a good four inches inside the tube and have hit a couple bone crunching bumps and it does feel secure. It is a comfortable seat. With the exchange rate these days that $100 is probably about equivalent to the price of a basket of fish and chips these days. i just can’t get excited by a bike like this. most people could find a better bicycle for cheaper, used. kind of a fugly bike. there’s like seven feet of seat post there. does it come in a bigger size? This guy is a liar. Look at how incredibly long that seatpost is. No way is his 6 foot 5. He must be at least 7 foot 2 or taller. highest seatpost ever. hysterical. I want it for riding through my hilly neighborhood and I am wondering about the quality; How is your bike holding up? I am not looking for a cheap piece like the Schwinn cruisers at Target and Wal-Mart. I would like something that will last a few years or more. Feel free to email me any words of wisdom on the issue, it will be much appreciated!